The first single grain whisky from the House of Suntory. Mild, smooth and elegant with a clean, clear finish.Born in September 2015, Suntory Single Grain Whisky Chita is completely different from the ordinary grain whiskies used in blended whisky. To imbue greater complexity and depth of flavour, Shinji Fukuyo chose to age Chita grain whisky in wine and Spanish Oak casks, in addition to American White Oak. The result is a milder, smoother grain whisky with unparalleled sophistication and a clean, clear finish. Chita grain whiskies have traditionally been used as the 'dashi' or broth that enhances the harmony of Suntory blends. Through continuous research and innovation, Chita's grain whiskies have achieved an unrivaled sophistication and a level of complexity that lets them finally take center stage. Flavours on the nose of Crème brûlée, cardamom, acacia honey and blossoming rose. On the palate it is mild and smooth with hints of mint, and deep honey. 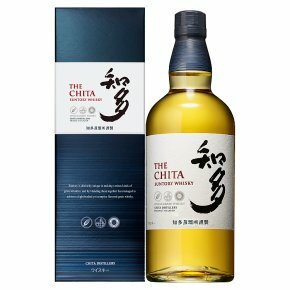 Shinji Fukuyo describes The Chita Single Grain Whisky as the ?serenity of Japanese whisky.? Like the misty, calm seas of the Chita Peninsula on a day of elegant stillness, this airy whisky has a presence that is unmistakably serene. "There is a quiet confidence and tenderness in our grain whiskies. These qualities allow them to be their own heroes, whether in a blend or featured as a single grain whisky."